Platinum PADI Course Director and Elite 300 Award. We had a visit during our current PADI IDC today from the PADI Regional Manager to present me with two awards. Andy came by the dive centre to present me with the two highest awards in the PADI system – Elite 300 Instructor, and Platinum PADI Course Director ! The Elite 300 Instructor award is the highest award in the Elite Instructor programme. This is awarded to PADI Instructors who certify three hundred or more students in a calendar year. For 2016 there were seventy-five PADI Instructors worldwide who achieved this milestone. The Platinum PADI Course Director rating is the highest rating a PADI Course Director can earn – the highest level of PADI Instructor ! It is awarded to the top Course Directors around the world who issue a certain number of PADI Instructor-level certifications each year. For 2017, there were less than one hundred Course Directors globally who reached this landmark. Here’s to a busy 2017 and more PADI awards to come next year ! 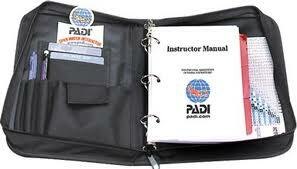 The PADI Instructor Development Course (IDC) is an intensive programme, usually lasting around twelve days. There is a lot of new information and knowledge to take in during this time-frame, and your course will be a lot easier if you are not also trying to re-learn things that you should already know as a PADI Divemaster. Your IDC training will be much more relaxed, and the IE will be much easier, if you are comfortable with dive theory and a few other things before you arrive. You will spend time during the IDC going through this, and completing more dive theory exams, but there will also be a lot more information for you to take in, and most nights you will have teaching presentations to prepare after a full day in the classroom. I like to give my candidates a set of dive theory exams on the first day of the IDC, and I would expect everyone to be able to pass with a minimum score of 75% in each of the five subjects – Physics, Physiology, Equipment, Dive Skills & The Environment, and The RDP & Decompression Theory. When people book for an IDC with Go Pro In Paradise, we send a link to the students with materials to study before arriving – dive theory study notes, practise exams, knot tying videos, RDP revision questions etc.. A few of these study tools are also available to download from the Go Pro In Paradise website. We also have a few videos to help understand the dive theory on our YouTube channel. It will also be beneficial if you are also familiar with the ‘reef knot’, or ‘square knot’, – as this is sometimes the result of a sheet bend going wrong, and you need to be able to recognise this error. The more comfortable you are with all this information before you arrive, the more you will be able to focus and the new information and spending your evenings preparing your teaching presentations for the next day. If you also need to spend your evenings trying to figure out how to calculate minimum surface intervals, or trying to remember the difference between convection and conduction, then you will be a lot more stressed during your training. When you book an IDC with us, we will start helping you prepare straight away. We don’t just wait until you arrive and then try to cover all this during twelve days. Our IDCs are nice and relaxed when the students have revised the information that we send them at the time of booking. 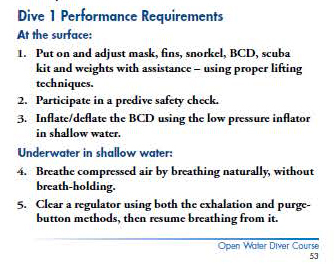 Quite often on an Open Water course this skill gets brushed over and taught too quickly. But if you spend the time explaining the importance and the effect of breathing correctly underwater, you might find that your entire Open Water Course will flow more smoothly. As an instructor, do not be too quick to place extra weight on the student’s belt when they can’t descend at the start of Confined Water Dive 1. Instead, take the time to explain the correct breathing pattern, and the importance of emptying the lungs on exhalation. Once the student divers do this, they should descend more easily, and now right from the beginning, they have understood the correlation between breathing and buoyancy/depth control. Their instinct now, should they start to rise in the water will be to exhale, rather than to reach for the deflate button. The New PADI Instructor Manual is available ! New year, new career ? Two happy new PADI Instructors ! Our next PADI IDC will be taking place on Koh Phi Phi at Phi Phi Barakuda, and will start on January 30th. If there’s anyone contemplating becoming a PADI Instructor, there’s still time and spaces on this IDC. Please e-mail me at rich@go-pro-in-paradise.com for further information. We have plenty of other IDCs planned throughout 2014 too. Why not take a look at our IDC schedule to see if there are any dates that would suit your plans. If there’s anything you would like tom know about making the step to become a PADI Pro, either at Divemaster or Instructor level, please feel free to drop me an e-mail on rich@go-pro-in-paradise.com. Have a great 2014 everybody ! The end of 2013 is already edging nearer. And high season on the west coast of Thailand is even closer. So this is the perfect time to come and take your PADI IDC in Thailand with Platinum PADI Course Director Richard Reardon. The next IDC is only a few days away, but we have another three IDCs scheduled after this one on Koh Lanta and Koh Phi Phi. With high season just around the corner too, it is a great time to take your IDC as employment opportunities are very good. Koh Lanta and Koh Phi Phi both have a high season running from November through to May and there will be large numbers of students passing through just waiting to explore the beauty hidden beneath the Andaman Sea. The diving from these two beautiful islands is ideal for the novice diver, and a great place to begin teaching. Water temperatures hover close to 30° year round, visibility averages 20m, the currents are mild and the marine life exquisite. Three happy new instructors ! Next up we will be undertaking some PADI Specialty Instructor training. All three candidates will be completing MSDT Prep to become qualified to teach five PADI Specialty courses. We will be training in AWARE Shark Conservation, Digital Underwater photography, Deep, Nitrox and AWARE Fish IDC specialties. Proin arcu est, pharetra sed viverra eget, placerat feugiat nisi. Donec placerat viverra euismod. Curabitur fermentum laoreet ante ac consequat. Sed ut magna nibh Curabitur fermentum laoreet ante ac consequat. ad Proin arcu est, pharetra sed viverra eget, placerat feugiat nisi.